The St. Ignatius Mission was founded in 1854 by Jesuit missionaries on the Flathead Indian reservation in western Montana. At one time the Mission was home to the first Jesuit theological and industrial arts school in the Northwest, the first Catholic Sisters and Catholic school in Montana, a hospital, sawmill, flour mill, printing press, carpenter shop and blacksmith shop. Today the Mission consists of four buildings: two of the original residences, the rectory and the church. The missionaries and the Indian people worked together to build the church in 1891 using locally made clay bricks and lumber hewn from trees in the surrounding area. The most extraordinary feature of the St. Ignatius church are the 58 murals painted on the interior plaster walls. These works of art were painted in 1901-1902 by Brother Joseph Carignano, an Italian Jesuit with no professional art training. Murals of this type are rare in this country and have been leaving visitors from around the world awestruck for over 100 years. The east wall has shifted causing three of the largest murals to crack and buckle. Pieces of the plaster have already fallen, and time is of the essence to prevent the destruction of this historical and cultural treasure. Funds raised here will be used to stabilize the murals and stop any further damage. We are applying for grants and exploring other sources of money to fund the full restoration of these exquisite works of art, but that is a long process and it is imperative that work begin immediately. These funds will be used to bridge the gap until full funding is available and allow the art conservator to stabilize the murals and develop the necessary action plan to restore them to their former glory. The stress on the wall makes this project time critical, and each passing day further imperils this important historical and cultural masterpiece. 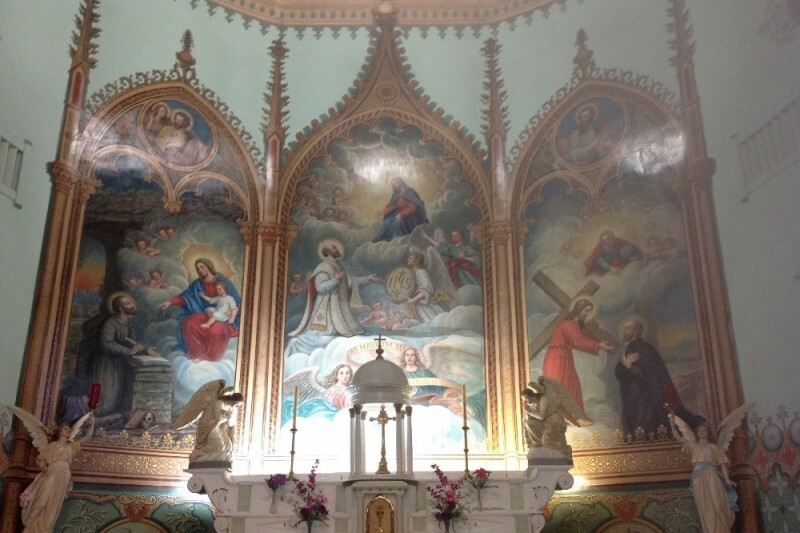 The murals of the St. Ignatius Mission are truly one of a kind. We must preserve this sacred work of art for it is irreplaceable and can never be duplicated. Here are photos of the murals before the damage. Help us restore and preserve this exquisite piece of art and cultural history. To all who have donated so far thank you very much. Donations are slowing down now but the damage to the murals has not. Please share this message with your friends, neighbors, relatives or anyone you think might help. God Bless you and your family. We sincerely thank you all who have contributed, shared or posted about this restoration project. Losing the murals off the walls of this historic mission is unthinkable. Please continue sharing and/or posting. To date we have raised around 7% of the goal. We need everyone's help at this point. Thank you. Great News, so far we have had 24 donors for a total of $1,470 donated for the project. We are on our way with 3% of the funds we need. Please spread the word to everyone you know who might help with this very necessary project. Blessings to all. Thank you so much to those of you who have donated. It means so much to know this historic Mission has so many friends. God Bless each and everyone of you. Hello. I visited the mission on April 11th, 2018 while on a business trip from Florida. I did not have any cash with me and I knew I might not ever have a chance to return but I took one of the $5 booklets. I am making this donation to cover the $5 booklet plus some extra. Please keep up the effort for that very special and beautiful mission. I hope to return one day on a personal trip and bring my wife to see it. What a beautiful place and we so need to preserve what is there! Be sure to stop and see the beautiful murals. I challenge all nurses in the Lake County area to match me.. I have personally never been inside the Mission but still have it on my bucket list since I was born here at St Luke. I am grateful I can be a part of preserving the sacredness and history of the greatest gem in the Mission Valley. Also in memory of Barb Conley who recently passed away.